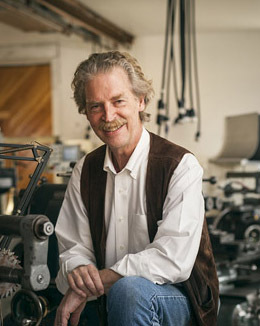 Over the course of the past 36 years, Thomas Lie-Nielsen has become America’s preeminent toolmaker. His woodworking tools are highly sought-after today not only for their proven performance, but also for the superb standard of excellence incorporated in their manufacture, a quality that has been recognized by discriminating craftsmen worldwide. Highland Woodworking has taken delight in providing Lie-Nielsen Tools to our customers for almost three decades. One does not have to be a professional craftsman to appreciate the beauty and functionality of these fine tools. Indeed, exposure to this level of quality has been an effective source of inspiration for many amateur woodworkers as they equip their workshops and refine their joinery skills. In honor of Lie-Nielsen’s upcoming Open House celebration in Warren, Maine next month, we are sharing here our interview with Tom that first appeared in Wood News a number of years ago.